Would you love to know how much time you spend on Instagram? For some of us, when we log in to Instagram or open the app, it is a journey of interesting scrolling that often leads to losing track of time. Yeah! 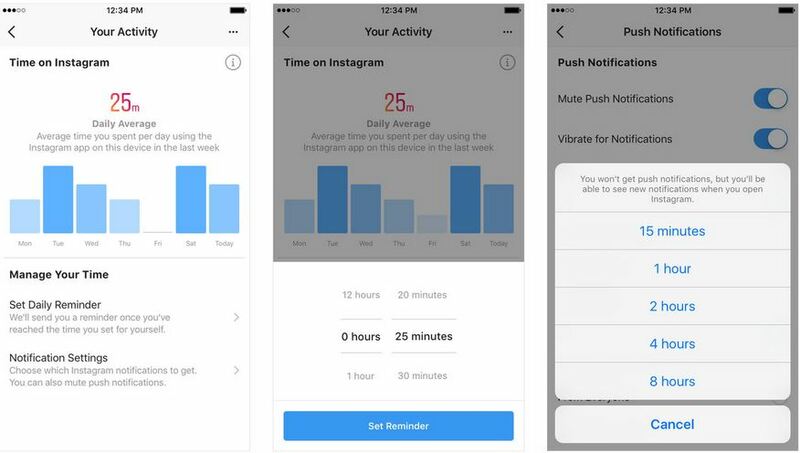 there is a new update you should know about; Instagram has rolled out a dashboard that lets you set daily limits for using the app and an option to temporarily mute push notifications. This is in line with the attempts by Instagram’s parent company, Facebook, to introduce new features to help users fight social media addiction. Besides trying to fight fake news and abuse on Facebook, CEO Mark Zuckerberg has preached a mantra of “time well spent” on the social network, instead of focusing on the overall time people spend on the service. According to a Deloitte survey, tech addiction has become a serious—people check their phones an average of 47 times a day. 89% of us look at our phone within an hour of waking up, an increase of only 1 percent from last year. 81% of us look at our phone an hour before going to sleep, a number that’s remained constant from 2016. Last year, a survey by the Royal Society for Public Health noted that Instagram was the worst social media platform for mental health. While Instagram scored points for self-expression and self-identity, the survey found that the app was associated with high levels of anxiety, depression, bullying and FOMO—the fear of missing out. You can access the new feature through the ‘Your Activity’ menu in the app which you can find by tapping the icon on the top-right corner of your profile page. You can also set a daily time limit for the app; if you cross it, Instagram will alert you with a notification. However, we agree that the hard part is acknowledging the alert, and closing the app. Do you think this changes anything for you? ← How Soon Will Twitter Get the Edit Button?